Not to be confused with The Quest for the Holy Grail. 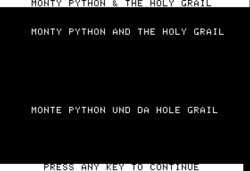 Monty Python and the Holy Grail is an Eamon adventure written by Nathan Segerlind. The Pathetic Hideout of Mr. R.
This page was last edited on 4 September 2018, at 10:16.